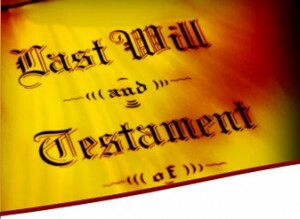 A New Jersey woman who claims she was disinherited from her father’s will because she married a Jewish man has lost another chance at having the will set aside. Wolin cited her relationship with her Jewish husband as the reason for the strained relationship with her parents, who forbade her several times from seeing her now husband based solely on his religious faith. The couple eventually married and after her father passed away, the contents of Jameson’s will came to light. Wolin filed a complaint alleging that the will should be invalidated, in part, because of its religious discriminatory intent. Jameson’s estate filed a motion to dismiss Wolin’s claim based on a failure to state a claim—the lower court agreed and a New Jersey appellate court upheld the lower court’s decision. Although Wolin alleged other claims in favor of invalidity of the will, Wolin’s main argument stemmed from the fact that she claims her father’s alleged religious discrimination violates public policy. A will may be contrary to the principles of justice and humanity; its provisions may be shockingly unnatural and extremely unfair. The court took it a step further and concluded that even if the will was motivated by discriminatory prejudice, it doesn’t violate public policy because the right to dispose of one’s property according to their wishes has been a long established right. Just as with any other law, laws vary by state. When it comes to wills and testaments though, a few key principles generally apply everywhere and there’s only a handful of scenarios that could invalidate a will. If the testator executed the will with testamentary intent, without any fraud, duress, undue influence or mistake, was of sound mind, and executed the will in the presence of witnesses, then a court is bound to follow the testator’s wishes. What Exactly Can’t You Put in a Will Then? Obviously, there are certain items that cannot be included within a will, but for the most part a testator has extremely broad discretion when it comes to disposing of their property. The number one thing states won’t let you do is disinherit a spouse, whether that be through a specific law prohibiting it or through laws put in place to protect spouses by allowing them to select what’s called an elective share of the estate. Second, any terms contradicting the language of a contract regarding property won’t be enforceable either. Contract law will control over estate law and this is typically evidenced in the form of retirement, life insurance, and stocks, among a few others, which are disbursed according to their plan documents. Had Jameson left a provision in the will stating that Wolin were to only receive her inheritance if she converted from Judaism, she probably would have had a much better argument to invalidate the disinheritance clause. Currently, Louisiana is the only state that won’t let you disinherit a child and that’s only if the child is mentally or physically incapacitated or is 23 years of age or younger. Most states want a specific intention to disinherit a child to be clearly written, which Jameson did, because a mere failure to mention a name in the will leaves wriggle room for a disinherited child to contest.